David Milch's long awaited Deadwood movie will premiere this spring on HBO. The show was infamously canceled in 2006, after three seasons and 28 Emmy nominations. Ever since then, a movie has been talked about as a way to provide closure. Milch originally signed on to make a pair of two-hour television films in place of the fourth season back in 2006, but HBO later announced that the project had a slim chance of happening, which makes this whole movie project a really exciting thing for fans of the original series. A spring release date is expected for the Deadwood movie, but a concrete date has yet to be announced by HBO. If the release timing ends up as true, the movie will be eligible for the 2019 Primetime Emmy Awards. Production on the project started back in November of last year and we were treated to some first-look images of Ian McShane as Al Swearengen and Timothy Olyphant back as Seth Bullock. The two men look pretty much identical to how they did in the series over 12 years ago now. In addition to Ian McShane and Timothy Olyphant, the Deadwood movie sees the return of Molly Parker (Alma Ellsworth), Paula Malcomson (Trixie), John Hawkes (Sol Star), Anna Gunn (Martha Bullock), Dayton Callie (Charlie Utter), Brad Dourif (Doc Cochran), Robin Weigert ("Calamity" Jane Canary), William Sanderson (E.B. Farnum), Kim Dickens (Joanie Stubbs), and Gerald McRaney (George Hearst). The story takes place 10 years after the original series, as the characters reunite to celebrate South Dakota's statehood. Former rivalries are reignited, alliances are tested and old wounds are reopened, as all are left to navigate the inevitable changes that modernity and time have wrought. The Deadwood movie was written by David Milch, and HBO is keeping the lid tight on the specifics of the storyline. However, when Milch was considering making a fourth season in 2006, he noted that a plague and a massive fire would be two of the main story pieces. MIlch has not confirmed any of that information for the upcoming movie, and it's likely that those story ideas have been changed in the past 13 years since HBO cancelled the hit show. Thankfully, we won't have to wait too much longer to see it all go down. 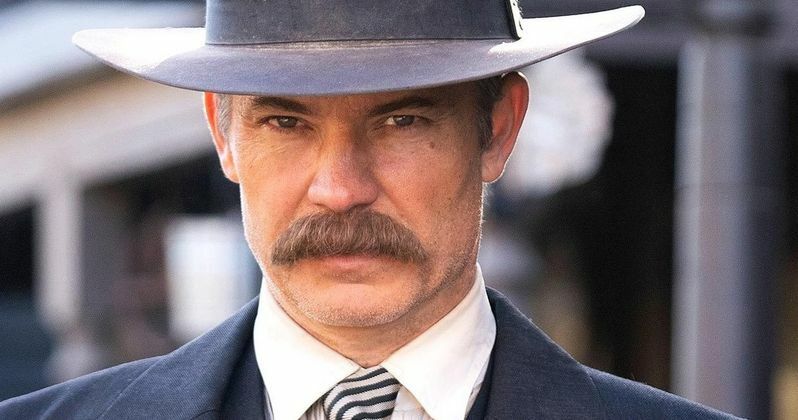 Daniel Minahan is directing the Deadwood movie. W. Earl Brown, who played Dan Dority on the show, read the script back in May of 2017 and called it "f*cking thrilling and f*cking heartbreaking," which has made fans of the hit HBO series pretty happy to hear. Fans have been waiting a long time to see these characters back together in the Deadwood world, so hopefully David Milch and Minahan deliver the goods. While no specific release date has been announced, expect that news to drop really soon. The Deadpool spring release news was first reported by Deadline.